Battle of the losers. Not saying that they are losers, but they just finished bottom of their groups. I'm pretty sure this will game will happen. 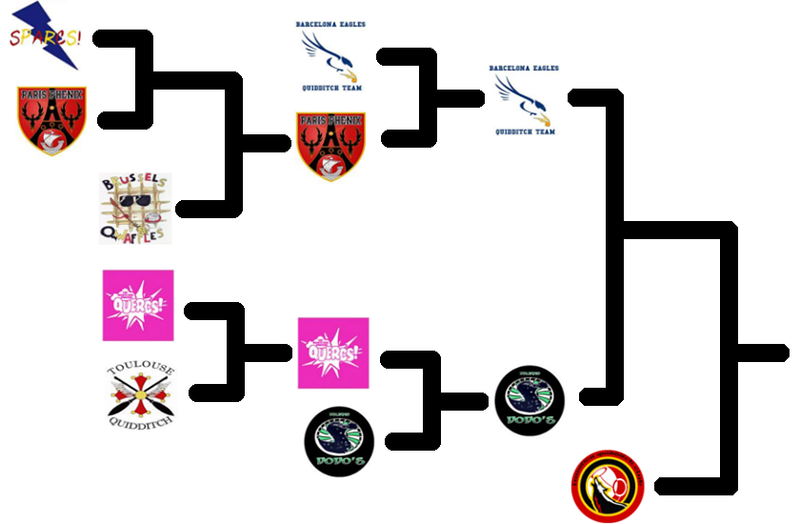 The Sparcs will have played about the best teams on the tournament yet and will have played 1 more game than Toulouse. Also Toulouse will have had more rest by this game. When Toulouse doesn't have any games anymore in the group stages, the Sparcs still had. This will give Toulouse the perfect opportunity to look what the playing style is of the Sparcs. In every way I think about it, Toulouse has all the advantages. They have more experience, have more rest, have played less games, etc etc. Toulouse will win. Both of these teams have never met before. Lunatica took the top spot in Group 2, but it's not because Phénix only got 4th in Group 1, that they are not equal. Both teams are tend to play really fast. The key players to look out for will be Valentin Farese (Paris Phénix) and Andrea Miglietta (Lunatica QC). When it comes down to beater play, Lunatica should be the better team. French teams are known for their lack of bludger play. Lunatica has a strong defense, where they combine their beaters with man-pressing chasers. Paris Phénix is known for their strong chasers in offense. If Lunatica doesn't start with a gap of at least 3 hoops, they might experience some problems. One way or another, Phénix always finds a gap to score (watch for Valentin to run into them). Lunatica should get room on the other side on the field, because Phénix is an offensive team. Their keeper, Arnaud De Cintaz, tends to move up too much which makes it really easy to infiltrate Phénix's hoops. Also Phénix beaters tend to go up with the offensive chasers. If Lunatica plays it smart and can use Phénix's speed to their advantage, they'll win. And I know Lunatica can play really smart. If it'd come down to a snitch catch, Lunatica would win. So I think Lunatica can pull this one off. It'll be a game everyone would love to watch! The biggest reason I give it to Lunatica, is because this game can get decided with smart speed. And you need energy for speed. Lunatica will have had less games and more rest. Oh dear god no. When I was arranging that not-so-fancy graphic above, I literally was like "oh god no. This can't be true." Ahhh. The great old Belgian derby. These 2 teams have had some past already. They were found around the same time, have played several friendlies already and played a nail-biting thriller game at EQC for a World Cup VII spot. 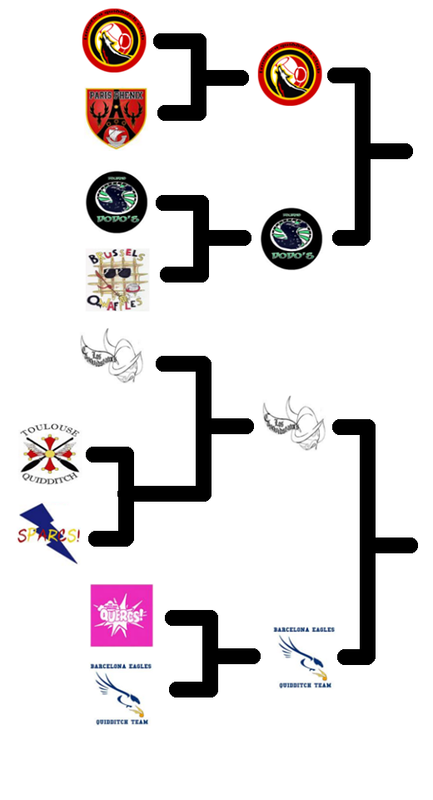 The Qwaffles won at EQC, but never managed to win against the Dodos since. Although, the Qwaffles' keeper, Nicola Grosjean, was injured because of EQC for half a season and could not play in the friendlies. Also several players who were at EQC for the Qwaffles could not attend those friendlies. The main force behind the bronze medal of the Qwaffles will attend BMT. This game... oh jesus! No, I'm not talking about James Burnett, although, I can totally use him to make a jump to what this game will really about.... beaters! Damien Leclaire and Laura Mailleux vs Louis Lermytte and Inke Gieghase. Both duos are one of the best beater male-female duos in Europe. To all the beaters in all the teams... if this game happens... you should totally watch this game! But of course hoops have to be made. With Seppe De Wit and Faber Huyse on the Dodos side, and Tanghi Brunalunettes and myself on the other side, this will also be beautiful. Just everything on this game will be beautiful. Brussels won't really be having much female power in chasing, but nor has Dodos. At this moment, I think Dodos are just a little bit better than Qwaffles, that's why I am giving the win to the Dodos (they're only in the lead by 52% in my head; this game might just turn out differently). Toulouse is NOT strong enough to defeat Los Conquidstadors. Sorry Toulouse, maybe next time. If a phoenix gets struck by lighting, it'd die. But a phoenix regenerates out of its own ash. Losing to Lunatica will only want Phénix to be stronger and definitely not want to die against the Sparcs. Sparcs won't survive the wrath of the phoenix. Phénix is going to win this one. 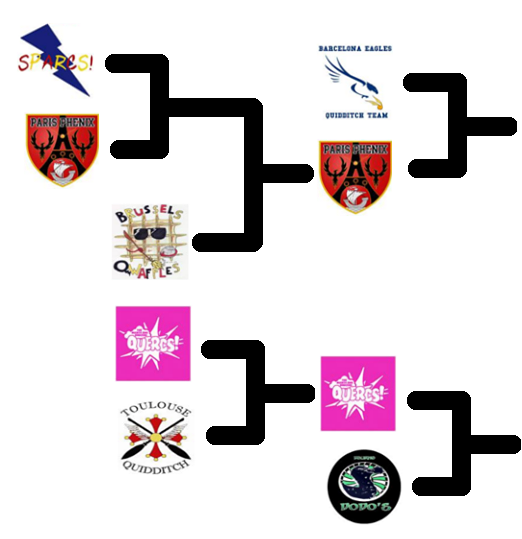 And the Sparcs will be eliminated from the tournament. I don't think Toulouse can survive this. The cross will be taken from the wall. Toulouse will be eliminated. The last time the Qwaffles played Paris Phénix was at the first tournament of last season: Brussels Muscles Invitational. 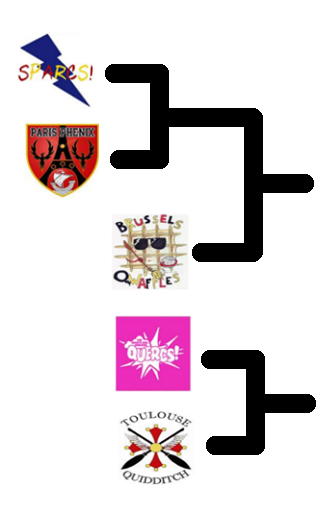 The first game at that tournament was Qwaffles - Phénix. Phénix did win the game with 20 - 60*, so they were kinda struggling. This surprised a lot of people, since they were the reigning European Champion back then and went to World Cup VII Both of these teams have improved since. I think if the Qwaffles played Phénix on the 2nd day at EQC, they could have beat them with just a bit. But I don't think that's going to happen at BMT. I think Phénix will win, purely because they believe in it. The moment Brussels gets into the Losers bracket, they won't care too much, they'll play for fun and see what will happen. Phénix is all about winning and want to advance, so they'll do everything to win. The last time the Eagles played a British team, was at EQC. 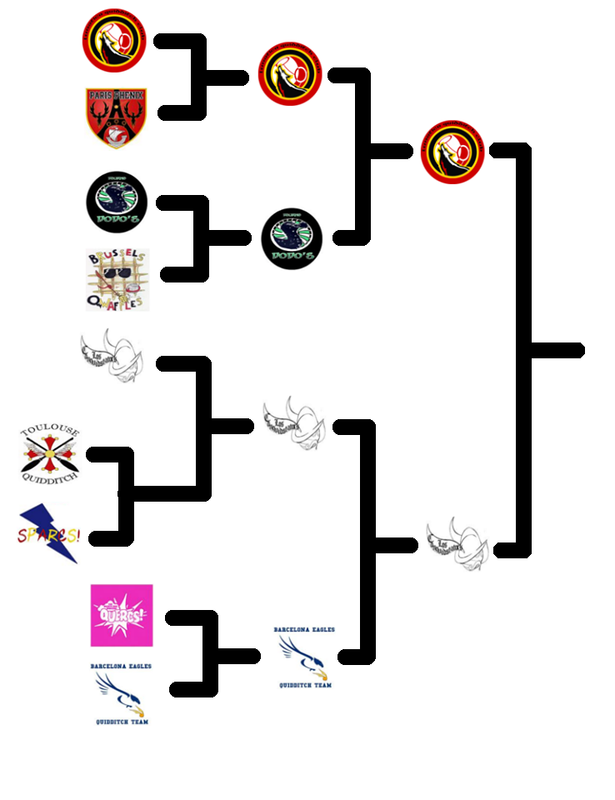 That time it was versus the current European and British champions: Oxford Chimeras. The Chimeras destroyed the Eagles with a 140* - 20 shutdown. I don't think the Eagles want to see that happening again. Unfortunately, I do think Eagles are going to lose this game... British quidditch is just bigger and better. And mainland Europe just doesn't know a lot about the players/teams from there. The mainland European teams only really know Oxford... I think Los Conquidstadors can be as strong as Oxford, and beat the Eagles. Group rematch! But I think it will result in the same: a win for Dodos. Barcelona is going to win. Lunatica is going to win, Barcelona is finishing this tournament with a 3th place. I seriously could write about this forever, but if I would follow me own logic from the beginning on, Los Conquidstadors will win. I'm so tired right now. I've been working on this almost the whole day and wish I wrote more. I hope you like it. P.S. : The ranking is based on who's eliminated last to first. The first one eliminated gets the 9th place, the one not eliminated fets the first place. P.P.S. : sorry for less fancy graphics than the previous parts.